This morning I had an appointment with the audiologist: frankly I have to accept that the chances of her – it could have been a him, of course - being able to provide hearing aids which enable me to understand what people are saying to me are not good. The problem is that a hearing problems fall into two categories (possibly more, I am no expert): loudness and clarity. While the hearing aids amplify the voice of the person to whom you are listening (and also amplifies everything else) it does nothing to help with clarity. So often when I say ‘I can’t hear you,’ I don’t mean that at all. What you are saying sounds like gibberish.’ would be more accurate but probably not overly guaranteed to make friends and influence people. Still, there are a new breed of hearing aids available now and it is possible that these may be of more use. One of the problems is that the hearing aid microphones are beside my ear and therefore nowhere near the mouth of the person I want to hear. I have found the best answer is to use a wonderful system to communicate when I am in a one-to-one situation such as at home with Marcia. This comprises two units: the one she wears has a microphone – near her mouth – and a radio transmitter. I wear the radio receiver to which I listen using ear buds. The real problem is that it is a bit tricky in group situations when poor Marcia has to try to keep me up to speed with what others are saying. Well, I look forward to the new aids and hope that combined with a fair ability to lip read I shall once again be fit to be in company. The main audiology department is down in Plymouth but they hold clinics in Kingsbridge (thank goodness) which is far easier for us. 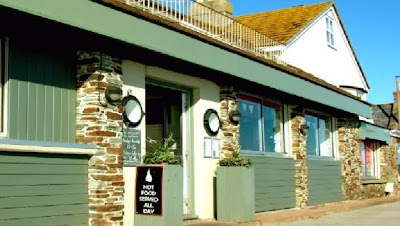 Anyway, it also meant we had a good excuse to go and eat lunch in The Boathouse at Torcross. This is one of our favourite places as it overlooks the sea on one side and Slapton Ley on the other. 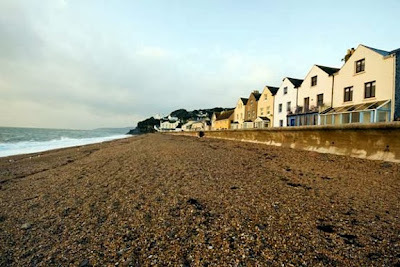 Torcross where these buildings are now protected by a sea wall. 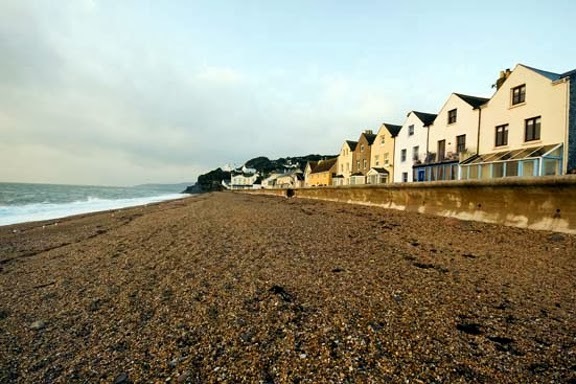 It is even more important than usual because Torcross is one of the places in the book that Marcia is working on at the moment. One of the delights here is the freshwater lake that lies behind the narrow shingle bank that separates it from the sea and on which the road runs. It is a wonderful habitat where there are many different species of water birds. As far as the new book is concerned, I am told that you will read about one known as Puddleduck who now lives in the village and, quite right, pops into The Boathouse for a meal every now and then. There was another reason for wanting to drive along the coast to Torcross. I have been trying to get some footage of big seas crashing over the sea wall that now protects the village and, as some you will know, a number of deep depressions have swept over the UK in the last week or so: each one bringing with it heavy rains and gale force winds. The tide was almost at the top as we drove out of Kingsbridge and, even better, the sun shone down out of a fairly clear blue sky. These two were sitting on our table when we arrived at The Boathouse. It was not to be: as we approached the coast I realised that Start Point was taking the brunt of the weather and the seas in Start Bay were nothing special. Then the sun went behind the clouds and, as we sat eating our lunch, the rain returned. Still, the day was far from wasted: as always when we visit the location of the book-in-progress, Marcia’s characters tell her things hitherto kept secret and she returns with new and fresh ideas. And here they are again with Justine (left) and Ziggy. Marcia and I – and all her characters (including the nasty ones) – wish all of you a Happy New Year: may 2014 be good to you. This inquisitive face belongs to a Tibetan Terrier Cross called Liquorice. In the deep mid winter . . .